You are here: Home » First Birthday Cake of the Season! First Birthday Cake of the Season! I think I mentioned a few posts ago about ramping up for the fall, or in my life, “birthday cake baking season”. It’s a long, long season – very sweet, of course – and very rewarding! It’s also a great opportunity for me to put some new recipes to use and rethink old classics. Sometimes, it doesn’t work out – but hey, even the scraps are delicious! 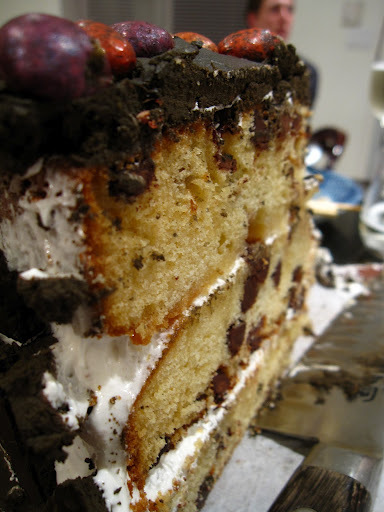 – Cake, although rich and butter was too dense for the filling – a sponge would have been more appropriate. – The filling would ooze out at the slightest pressure, in retrospect, I would have used the ganache as a filling instead. – The ganache was too sturdy! It spread too thin and crumbled during cutting in a really unattractive way. 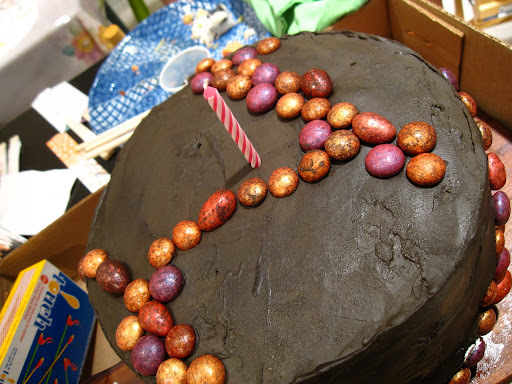 – I think I would have switched the filling and icing – the Frosting would have added a lot of drama and volume and the richness of the ganache would have been a nice contrast. 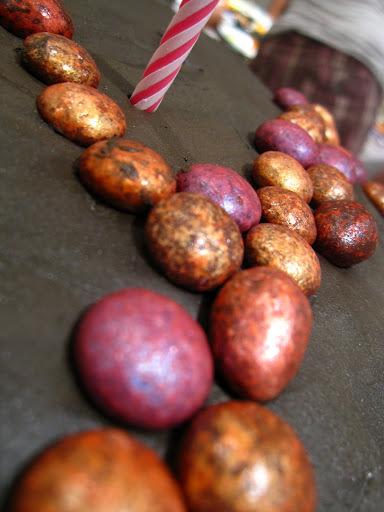 The decorations were some marbled M&Ms I received a while ago from my brother. I think you can buy them in some stores now, but aren’t they beautiful? I actually wanted to tile the entire outside with the candies, but I’m not sure I would have had enough. I decided to go with a freeform pattern on top and on the sides. Although the final product lacked that polish, I am still pretty pleased with the results. There are definitely lessons I learned here that will probably come in handy for the rest of the season! Stay tuned for the next cake!